Asia is a popular holiday destination for New Zealanders, and cruising is a cost effective and efficient way to get around the region. Asia is often marketed with 7-10 night packages to one specific city, resort, or hotel, but a cruise gives you the opportunity to visit multiple countries and experience the different sights and sounds and cultures. From NZ there are now more cruise options on offer to explore this area. Launched in June 2009, the Seabourn Odyssey, as newest ship to the Seabourn fleet carrying 450 guests, recently debuted in the region cruising around Asia as part of her 2010 World Cruise. In a commitment to the region, Seabourn has also positioned the 208 guest Seabourn Pride permanently in Asia to operate 10 – 14 night itineraries. ? ?Both these Seabourn ships are in the 5 star plus, ultra-luxury small ship category and their facilities and onboard service, meet the expectations of a cruise designed for discerning travellers. Having cruised on Seabourn Odyssey, the unsurpassed service and “treats” which are part and parcel of the Seabourn experience, tick all the boxes for a memorable cruise. The onboard experience is relaxing and casual, and being pampered as a special guest ensures you are relaxed and prepared to explore the fantastic ports of call Asia has to offer, only to come back to the luxury of your ship at the end of the day. Gratuities for Seabourn staff are neither required nor expected. They are personable and treat you as a “guest” not just a “passenger”. Seabourn ships are beautifully appointed in natural and muted tones and are light and airy. The overall impression is spacious yet intimate, sumptuous yet understated. You can be casual, while enjoying an elegant environment. These are all-suite ships, and the suites are spacious with separate lounge area, large bathrooms, and plenty of storage and individual facilities.? ?Seabourn’s cuisine is award winning and the ships offer a variety of casual and elegant indoor and outdoor dining options, as well as 24 hour room service, and in-suite dining. The cruise fare includes all meals onboard, complimentary wines at dinner, and open bar policy around the ship – fantastic. The Seabourn Asia itineraries are exotic to say the least and include Singapore, Thailand, Malaysia, Brunei, Vietnam, Cambodia, China, Taiwan, South Korea and Japan. They include main ports of call, and because they operate smaller ships, they can access small harbours and less-visited places that the bigger ships cannot. Seabourn offer flexibility in exploring the destinations. You can join a small-group sightseeing tour, or a special interest group tour, custom design your own private tour, or explore on your own. There is no pressure to have to do arranged excursions. Seabourn promote authentic discovery, and assist you in getting the most out of the destination. All over Asia you see the paradigm of tradition that lives on in the Orient. In sophisticated neighbourhoods in China open-air markets are heaped high with exotic delicacies and every kind of herbal remedy imaginable. In Japan, skyscrapers and neon signs tower over ancient temples. Asia unveils the delights of spice-tinged markets, golden pagodas and idyllic isles. Visit the Forbidden City; tackle the Great Wall of China, or glide along the picturesque canals of the Mekong River. The big cities are Meccas for boutique and department store shopping, or for searching for bargains in the markets. Cruising into Padang Bay, Bali is a scenic pleasure. This is a tender port and Seabourn operates these transfers from the ship effortlessly and efficiently. As soon as guests alight from the tender, they are immersed in the hustle and bustle that is Bali. Bali leaves lasting impressions of delicate woodcarving, bold paintings, village processions, and costumed dancers, spiritualism and ethnicity. It has been called an “Island of Temples”, with more than 10,000 scattered across the landscape. Rice paddies carpet the lowlands, and cling to hillsides, and Mount Agung, over 10,000 feet high, dominates the surrounding area. Muara, Brunei is the port city for this oil-rich independent Sultanate on the northern coast of Borneo. Ruled by the famous Sultan of Brunei, one of the world’s wealthiest men, the country has a very high standard of living. ? ?Approximately 20 miles up the Brunei River is the capital city, Bandar Seri Begawan. Most people refer to it as BSB or Brunei City. It is a city of two terrains with the traditional and historic stilted water villages making up the aquatic districts, and the drier districts spread out over the flatter areas of land. One of the most impressive city sights is the gold-domed Sultan Omar Ali Saifuddin Mosque, which is dazzling in its intricate marble designs, and is particularly stunning at night illuminated by lights. The Royal Regalia Building is free to visit and is a museum of the sultan’s treasures. It holds his coronation regalia and many gifts presented by heads of state. ? ?You can see most of the city sights in a day, and the beaches around the area offer vibrant undersea life for excellent diving and snorkelling for additional activities. In Kota Kinabalu (Sabah) Malaysia, as in other ports, guests can join a complimentary “Shopping with the Chef” excursion to a local market where he will buy produce and talk about how and what dishes they will be used for. The fruit and spice market in Kota Kinabalu is a flurry of market commerce, and the sights and smells of spices and fruit tempt the senses. The ship berths just 5 minutes walk to the shopping and restaurant areas of the city so it is an easy place to explore independently. Kota Kinabalu is situated on the tropical island of Borneo, set against a backdrop of lush green tropical hills and facing the emerald green waters of the South China Sea. It is a modern capital, and the people are warm and hospitable. There are a number of sightseeing venues to visit, including the Sabah State Museum, Atkinson Clock Tower, and the Padang Merdeka (town square). Other sites in the city are the stilt villages built on shallow coastal waters, and 56 miles outside of the city is the impressive Kinabalu National Park, well known for its botanical garden and the massive Mount Kinabalu which rises 12,000 feet above sea level. This area is recognised worldwide for its significant botanical and biological species bio-diversity, with high levels of endemism (species which are found only within Kinabalu Park and are not found anywhere else in the world). It is rich in orchid flora with over 800 species, and over 600 species of ferns, 50 of which are only found here. Hong Kong is an iconic port of call for most cruises in Asia. It is an exciting port to cruise into and you berth at the cruise terminal in the heart of Hong Kong at the Cruise Terminal, only a couple of blocks away from Nathan Road. Hong Kong is divided into four sections: Hong Kong Island, Kowloon, the New Territories, and the numerous outlying islands. One hundred sixty-four square miles of dense real estate dominate Hong Kong Island, including banks and financial houses, enormous skyscrapers with futuristic architecture, opulent hotels, residential compounds on Victoria Peak, beautiful beach resorts and some of the oldest Chinese communities in the region. ? ?Hong Kong is a wall-to-wall shopping bazaar in a stunning setting. The interest in exploring Vietnam continues to grow and Seabourn includes different Vietnam ports in its itineraries. Ho Chi Minh City (formerly Saigon) covers an area of more than 800 square miles, stretching westward from the South China Sea to the Cambodian border. The land is overwhelmingly rural, dotted with villages and clusters of houses set amidst rice paddies. The downtown section of Ho Chi Minh City is still known as Saigon, and it is here the economic changes sweeping Vietnam and their social implications are most evident. The level of activity and energy of this city is frenetic and will amaze you. ? ?The fishing village of Hongai is a ferry port on magnificent Halong Bay. With its 3,000 islands rising from the clear, emerald waters of the Gulf of Tonkin, it is one of the natural marvels of Vietnam. These tiny islands are dotted with innumerable beaches and grottos created by wind and waves. A number of ports of call are made in China on the Seabourn itineraries, but Shanghai as China’s economic powerhouse is one of Asia’s most exciting cities. Key sightseeing highlights to view are the 400 year old Yu Garden, the famous Jade Buddha Temple and the colonial Bund along the Huangpu River. Referred to as the “Paris of China” and “Pearl of the Orient,” this vibrant city is a comfortable jumble of old and new. Like the rest of China, Shanghai is undergoing one of the fastest economic expansions the world has ever seen, yet it strives to retain its historical roots. 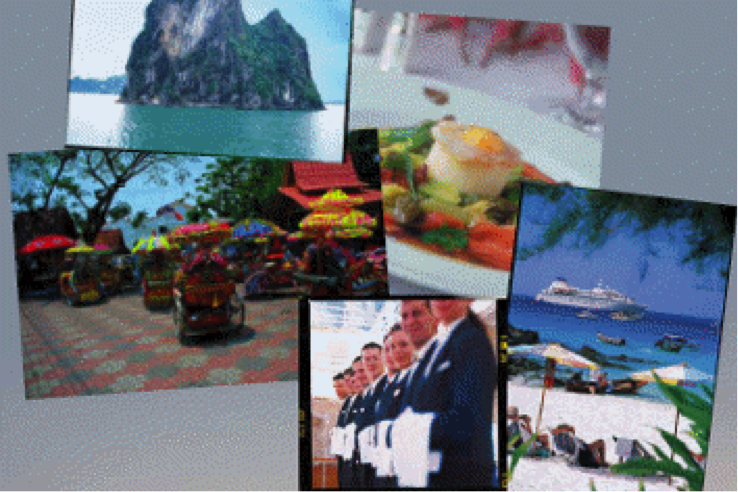 Seabourn is currently offering some competitive specials on their Asian itineraries. For details contact Seabourn’s New Zealand Representative on 0800 500 732, or contact your travel agent.